It’s no secret that colleges and universities today are under intense pressure and competition to fill their classes. According to a 2018 admissions survey by Inside Higher Ed, 90% of admissions directors say they are concerned about reaching their institution’s enrollment goals this year. Higher education marketers are also under pressure to prove that their marketing campaigns lead to enrollment. As a result, many are shifting their metrics of success from cost per lead (CPL) to return on investment (ROI). When analyzing the ROI of your digital marketing mix, it’s important to know that a simple side-by-side comparison of top-performing channels may not tell the complete story. The combination of specific platforms in your marketing mix will also impact ROI – a factor that is not often accounted for in most marketing attribution models. 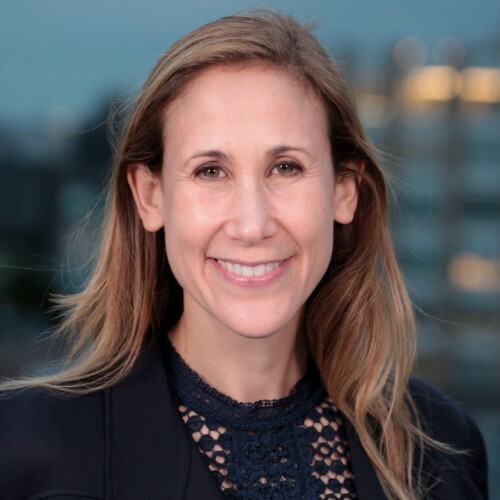 We found that, while the marketing team for one LinkedIn graduate degree client had only attributed 26 enrollments to LinkedIn ads, in actuality, LinkedIn campaigns had impacted 673 enrollments (a 25x increase over the initial calculation). This led us to ask the question: How does exposure to LinkedIn ads impact student enrollment from other digital channels, such as search and the institutions’ own websites? To answer this question, we partnered with Gray Associates, a higher education consulting firm, to objectively conduct a marketing analysis of prospective students from four academic institutions. Our research showed that not all leads from search and school websites are equal. Those that saw a LinkedIn ad were more valuable. 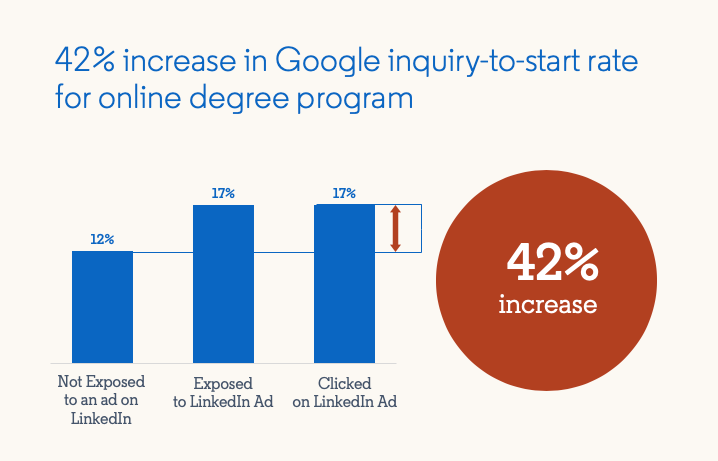 Google inquiries exposed to a LinkedIn ad before becoming a prospect were 42% more likely to start at the school. 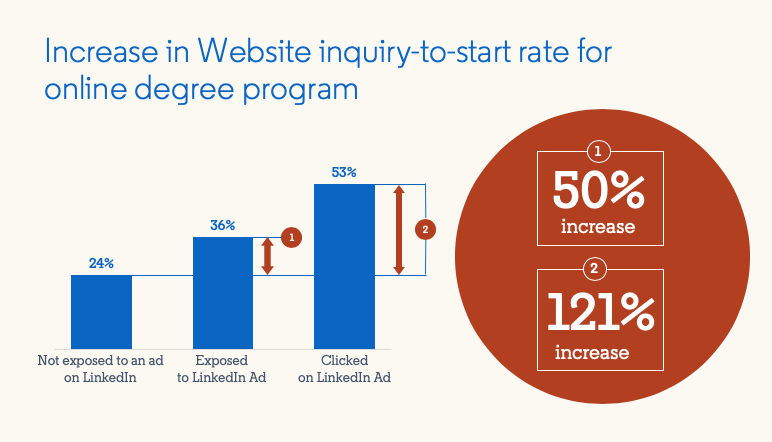 Inquiries from a school’s website that were exposed to a LinkedIn ad before converting were 50% more likely to start. We call this the LinkedIn Lift. LinkedIn is where the world goes to advance themselves professionally, and we’re seeing that people who click on a LinkedIn ad tend to be much more qualified and interested than the average person who submits a lead elsewhere. Check out our LinkedIn Lift Calculator to find out more about what the LinkedIn Lift can mean for your enrollment and your bottom line. Gray Associates concluded that higher education marketers are not completely accounting for the influence of LinkedIn ads. For one institution, they found that 11% of the prospects that were created within one day of viewing a LinkedIn ad were attributed to another source. When we expanded that lookback window to seven days instead of just one day after seeing a LinkedIn ad, that number increased to 17%. For higher education marketers, it’s important to understand that last-click attribution models is unlikely to give you the complete picture of your true marketing ROI. Adding more robust tracking methods, such as multi-touch attribution and longer attribution windows can help you gain a more accurate understanding of your marketing mix. A prospective student who clicks on a LinkedIn ad is significantly more valuable than an average lead. 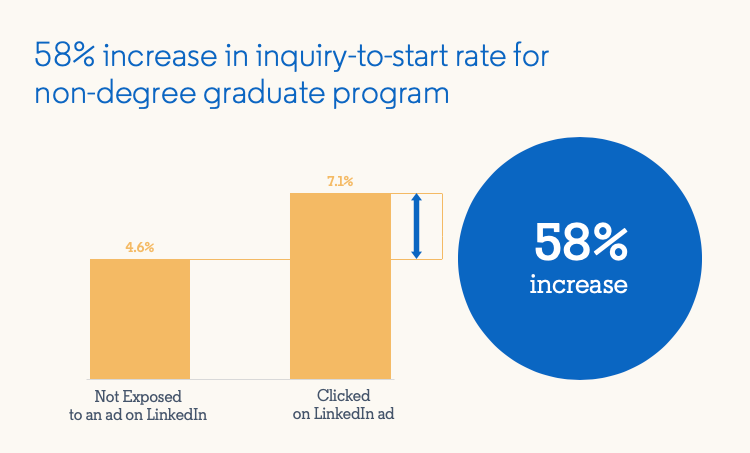 Gray Associates determined this by comparing the inquiry-to-start rates for prospective students who were not exposed to LinkedIn ads vs. those who saw and clicked on an ad. Just under 5% (4.6%) of people started in a non-degree graduate program after being exposed to an ad on a channel other than LinkedIn. However, more than 7% started after clicking on a LinkedIn ad, representing a 58% increase. This shows that higher education marketers should value leads that have clicked on a LinkedIn ad much more highly, since they are more likely to convert to students. Looking at another institution, we analyzed prospects attributed to Google to understand if we could see a similar LinkedIn lift. Among Google prospects who were not exposed to LinkedIn ads, 12% converted to starts. However, 17% converted when they were exposed to or clicked on a LinkedIn ad. In other words, Google inquiries that were exposed to a LinkedIn ad were 42% more likely to enroll and start a program than those who only saw a Google ad – showing that not all Google leads are equal. Prospects who also saw a LinkedIn ad are much more likely to apply and enroll. We saw a similar lift in student inquiries that came from a school’s website for an online degree program. Website leads that also saw a LinkedIn ad were much more likely to apply and ultimately enroll than those that didn’t. The difference is even greater for website leads that also clicked on a LinkedIn ad, making them much more likely to apply and ultimately enroll. Gray Associates found that of all leads collected by a school’s website, 24% started in a degree program. That conversion rate increased to 36% if the lead also saw a LinkedIn ad. Moreover, when a website lead has clicked on a LinkedIn ad, that conversion rate jumped to 53%. That’s a 121% increase in start rates for those that clicked on a LinkedIn ad compared to those that were not exposed to an ad on LinkedIn. The takeaway is that simply attributing leads to the website – and a marketing campaign – might be discounting LinkedIn’s influence on a lead. Just like the Google example, not all website leads are equal. Those that have been exposed to or clicked on a LinkedIn ad are much more valuable. This research proves that the addition of LinkedIn makes your current marketing on the biggest channels more effective. That’s likely due to the variety and types of ads that you can leverage on LinkedIn, as well as the state of mind of the LinkedIn members seeing those ads. To take it a step further, your advertising results on LinkedIn will improve progressively as you fine-tune your targeting based on what is – and isn’t – working. Because your targeting and creative matter greatly, as well as your bidding strategy, it’s best to engage the LinkedIn higher education team to implement this properly. The team can work with you to identify the right combination of creative, targeting and bidding – initially and over time. The onus is on higher education marketers to reach and engage prospective students in a more data-driven way. By letting these research findings guide your advertising plans, you can do just that and position your school to convert more leads to starts and revenue. Try our LinkedIn Lift Calculator to estimate the additional enrollment and revenue you can generate from LinkedIn ads. For a deeper dive into the research findings from Gray Associates, view the presentation.